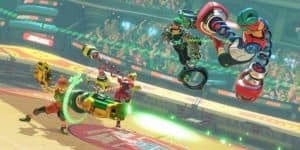 ARMS Update Includes eSports-Friendly Game Mode | Nerd Much? Nintendo is only dipping their toe into the eSports waters. Despite Nintendo’s often rocky relationship with YouTube content creators, their frontline game on the Nintendo Switch, ARMS, has another patch. Update 3.1 includes a brand new mode that might be pointing towards Nintendo’s foray into eSports. It’s called Sparring Ring and includes a square stage without gimmicks, like in the Warm-Up mini game. The latter stage will also be included in Ranked Match. The hint toward eSports comes with the fact that this is a standardized stage, and functions without the usual hazards of a normal ARMS stage. If you haven’t played the game yet, some stages have obstacles and dangers that can actually damage you if you’re not careful. As such, a clean stage like Sparring Ring is perfect for eSports to properly show off a beautiful clean match between players. At the moment, it seems that Nintendo is only dipping their toe into the eSports waters. There are currently Nintendo World Championships that players can compete at – Sparring Ring is sure to be a hit at these events. Whether Nintendo is actually going to go into eSports seems to be somewhat doubtful. On one hand, it would bring Nintendo in a serious gaming arena again. On the other, Nintendo is far too protective of their content. eSports would be a live streaming, pirating, stealing nightmare for them. That said, it seems much more likely that Nintendo would try to organize their own version of eSports and attempt to get the same audience to watch their content too. It seems a bit far-reaching for Nintendo to believe that eSport fans are going to take the time to watch ARMS too, but it really depends on how the company markets it and runs the events. For all we know, ARMS will look like the next Overwatch League and snag everyone’s attention across the world. ARMS is currently out on the Nintendo Switch exclusively.